This week, Chris Busch, the Director of Research at Energy Innovation: Policy and Technology LLC wrote a piece that appeared in both LiveScience and CaliforniaCarbon.info. Essentially the piece praised California's bold energy policies and claimed that our state's economy is flourishing because of them. Of specific note was a chart that showed our employment growth and a timeline of a few of California's energy requirements. Those policies include the Low Carbon Fuel Standard, the 33 percent renewable power mandate, the state's carbon cap-and-trade system, and California's building energy performance standards. The chart compared California's total employment growth since December 2009 to that of the United States. In aggregate numbers we are in fact outpacing the country. But what types of jobs are we growing? We know from a chart we did a few weeks ago that most of our growth is coming from sectors that pay less. This week we charted the same dates and numbers as Mr. Busch but added a percentage growth for California's manufacturing job growth vs. the U.S. The results show a large deficiency in manufacturing in California. At an average $77,000 salary and tremendous ripple effects in the economy, can we afford to ignore such a deficiency? 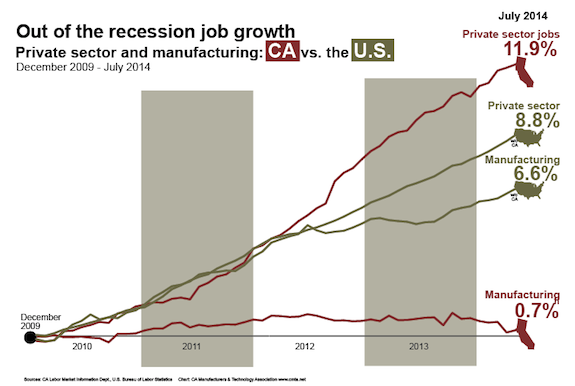 What state revenues are we losing out on by not keeping pace with national manufacturing growth? California's energy policies drive some of the highest industrial electricity rates in the country. Those costs will discourage manufacturers from choosing to invest in California, especially those looking to invest, re-shore, or scale up somewhere in the U.S.
Before concluding that California energy policies do not hurt jobs, we suggest that Mr. Busch and others account for the quality, as well as the quantity, of jobs we are losing and gaining in the state. * We used the same data source as Mr. Busch but we didn't include government in our total employment numbers, which might be why our percentages for "private sector" jobs are higher than their "total employment". California is a national leader in pushing renewable energy, lower greenhouse gas emissions and energy efficiency. State manufacturers have contributed to the effort by installing cost-effective technologies and instituting lean manufacturing processes to reduce their demand for electricity, natural gas and transportation fuels. No other state’s manufacturers have done as much. But with more climate and energy policies being proposed every day, it’s time to take stock of where we are and where we are headed. If California wants to be a model for others to follow, energy supplies must be both affordable and reliable to support a massive state economy that includes manufacturing and exporting products. Successful California manufacturers -- who employ 1.3 million workers at an average $74,000 salary – depend on priced and reliable energy to operate in this state. They need to stay competitive with manufacturers around the country and the world. Yesterday a group including CMTA, the Little Hoover Commission, the California Small Business Association, the California Business Roundtable, and others gathered to discuss the uncertain costs of California's programs on everyone who pays for electricity, powers a vehicle, or purchases a product in the state. “There is not a single, credible source of analysis and data that can inform companies and policymakers regarding the cumulative costs of California’s recent energy-related policies,” said Patrick Mealoy of the Navigant Consulting group. Navigant had examined key cost drivers of three prominent California-only energy programs -- the 33 percent renewable power requirement, the carbon cap and trade auction, and the low carbon fuel standard. Navigant’s analysis showed that the industrial community alone has dropped 17 percent of its electricity demand over the last two decades. At the same time, the residential and commercial class grew their demand by about 30 percent. In part, this means that industry is already lean and spent lots of money retrofitting facilities and finding efficiencies so they could compete with the rest of the country. Any new efficiencies could be expensive and either raise the cost of goods or cause the loss of jobs in the California economy. This month, electricity ratepayers, including manufacturers, will see their first big rate increase due partly from the 33 percent renewable power requirement. On average it will be a two-digit percentage hike for ratepayers in the Southern California Edison territory. Industrial electricity rates are already approximately 50 percent higher than the nation. Estimates are far higher than cost of living increases into the future. Job loss and high energy prices will be unintended consequences of our complex and overlapping clean energy goals. To avoid this outcome, lawmakers should require robust cost-benefit analysis to show how regulations can be reformed to achieve reasonable goals at the lowest possible costs. The Little Hoover Commission might have said it best at the event, “what California really needs is a ‘timeout’ on new energy mandates.” A timeout so we fully understand what we are getting into can only help make California’s exclusivity a trailblazing success for us and others. Most of the participants at Monday’s event were part of the simultaneous launch of the Californians for Affordable & Reliable Energy coalition (CARE) – a growing group of companies and trade associations to raise awareness about California’s escalating energy costs. List here | Join here. Governor Arnold Schwarzenegger could get a Renewable Portfolio Standard (RPS) bill on his desk after the state's legislative session ends this week. SB 14 by Sen. Joe Simitian would deny California utilities access to the most cost-effective energy and, according to the Public Utilities Commission, raise the state's industrial electricity costs at least 7 percent. The Energy Information Administration states that existing rates are already 45 percent more expensive than the nation and 80 percent higher than the western region. California industry can barely compete with its neighboring states and energy costs play a major role in that imbalance. The AB 32 greenhouse gas law that passed in 2006 already allows the California Air Resources Board to implement RPS in a cost-effective manner. Gov. Schwarzenegger should veto this bill because it will impose huge new costs and threaten high wage manufacturing jobs in California. In a strongly worded letter to Gov. Schwarzenegger, the petroleum industry yesterday warned that failure to properly implement a Low Carbon Fuel Standard could result in a fuel supply crisis similar to the electricity crisis of 2001. Today the AB 32 Implementation Group released a survey that polled consumers' attitudes toward the implementation of the California-only greenhouse gas law. The poll found that while voters initially support its goals, that support dips sharply when they consider the measure’s price tag of billions of dollars in extra costs for electricity, gasoline, and food, as well as higher taxes and fees. Recently, the California Public Utilities Commission released a report highlighting the difficulties of reaching a proposed 33% RPS and the conflicting impacts from the competing goals of the standard. California must be clear about the goal of a 33% RPS – whether it is to promote broad environmental and economic development benefits of renewables, to "move the renewables market", to reduce greenhouse gases, or some combination thereof. If the main driver of a 33% RPS is reduction of greenhouse gases, the state must consider the GHG impact of the transmission development and the possible fossil resources needed to integrate such a large build-out of renewable generation. California would then want to choose the most cost effective resources for meeting its GHG reduction measures, whether in-state or out-of state renewables, demand response, energy efficiency, fossil repowers, or other options. An integrated approach to procurement and transmission planning can best consider the costs and benefits of these options. One sidenote: This week, the Center for Energy Efficiency and Renewable Technologies released a study on the effects of reaching a California 33% renewable portfolio standard. The report said it would result in 200,000 new manufacturing jobs and as much as $60 billion to the State's economy. We appreciate their concern for the economy but I'm not sure passing one of the costliest and most unrealistic mandates in California's history and then calling it economic activity will help competitiveness here in the Goldish-Green State.